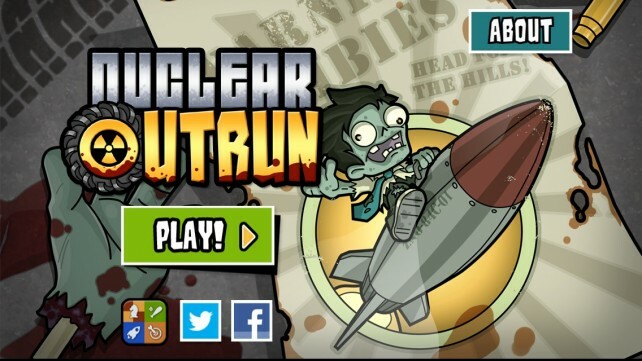 Nuclear Outrun (Free) by Gamenauts is an endless runner that isn’t so…endless. Rather than the traditional game, you only have a limited amount of time to get as far as you can and rack up the points. Really, if there’s one type of game that I always look forward to, it’s endless runner games. I just love the gameplay mechanic, and all of the challenges that await you while you see how long you last. However, regardless of whether they are side-scrolling or 3-D over-the-shoulder runners, sometimes they just get a bit stale. After all, you just run and run until you fall or crash into a wall, right? However, Nuclear Outrun shakes things up a bit by introducing a limited amount of time for you to actually run, and I am really enjoying it. The setting of Nuclear Outrun is just that — a world crisis has happened, and a nuclear missile is about to crash, ending the world as we know it. Of course, this could have all been avoided, but where’s the fun in that? 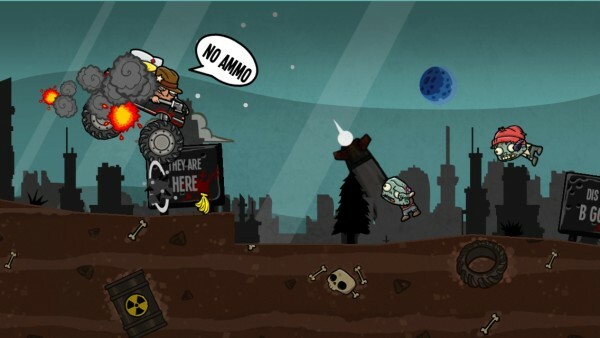 To make things even more exciting, there are hordes of zombies and robots that can fly while shooting their own missiles at you. 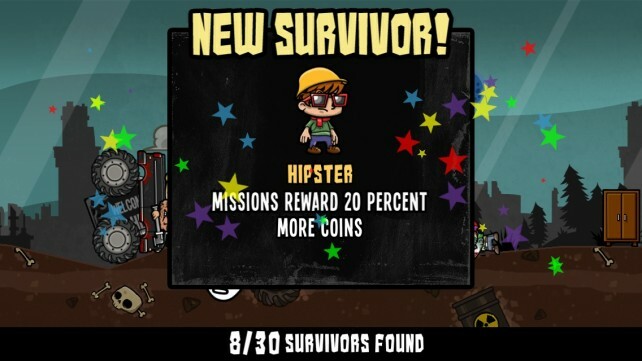 Survivors of the crisis will be trapped in large containers, and it’s up to you to rescue them! One of the greatest things about this title are the graphics. It’s colorful (in a dark way) and cartoony, but still very detailed. Game animations are smooth and fluid, from your truck driving through beaten terrain to the ridiculous ammo that you will be firing at your foes. 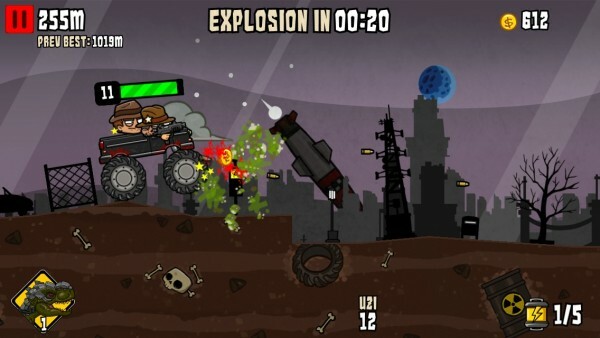 An action-packed soundtrack will rev you up for your zombie massacre before the world blows up. Like all other running games, there is only one game mode, but you’ll keep playing with the “I can do better” mentality, which makes these games so addictive. But as I mentioned earlier, Nuclear Outrun has a time limit for each run you play. A countdown to the nuclear explosion will be at the top of the screen, and you can also see the missile falling in the background. 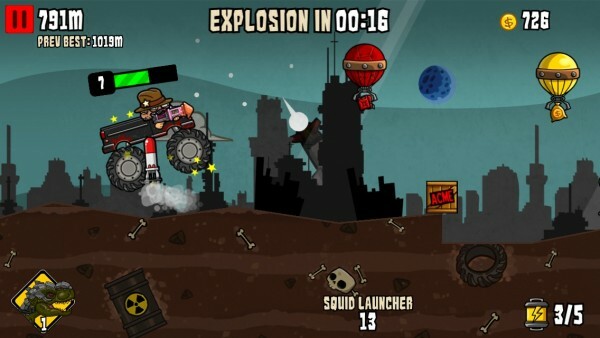 In this time frame, you need to press on to rescue as many survivors as you an while also shooting down the obstacles that stand in your way. 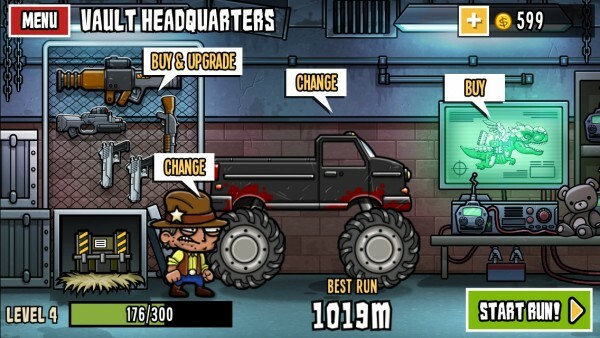 Each run will have your truck driving automatically. 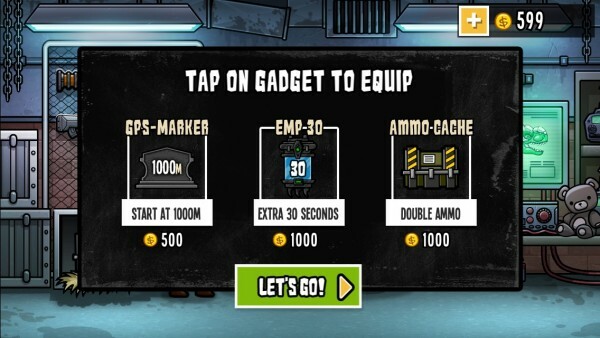 You’ll be armed with a gun, and to shoot zombies and robots, all you need to do is tap on them. 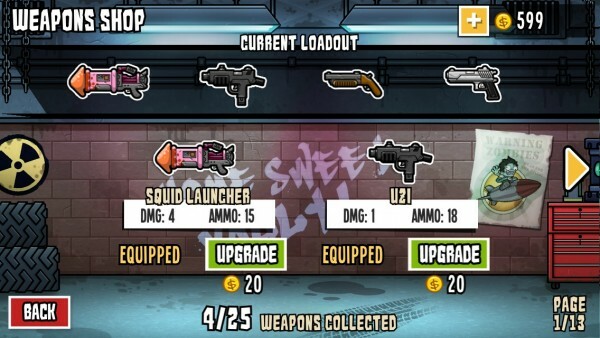 However, each gun will have its own limited amount of ammo (there are fun ones too, like squids and farts), so you need to be wise with how you use it. To pick up survivors, just drive over the holding cell. The survivors basically serve as unlockable characters that you can use to drive the truck, and each of them will have their own unique talents, such as making vehicle acceleration 20 percent faster, giving extra bazookas, or a bit more armor or ammo each run. The only catch, though, is that to unlock them as playable characters, you need to drop them off at the bomb shelters. The shelters are also where you will pick up additional guns. Just because it’s the end of the world doesn’t mean that you don’t need to worry about damage to your vehicle. 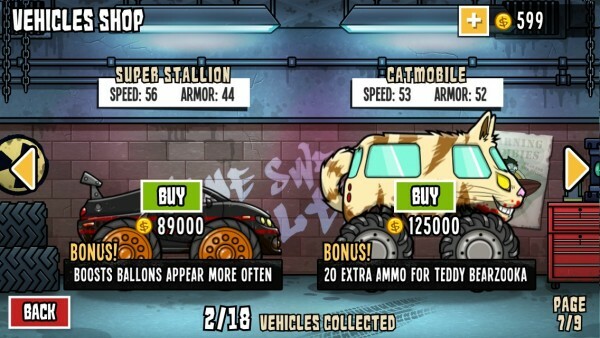 If you run over zombies rather than shoot them, your car will take some damage, as indicated with the armor bar. 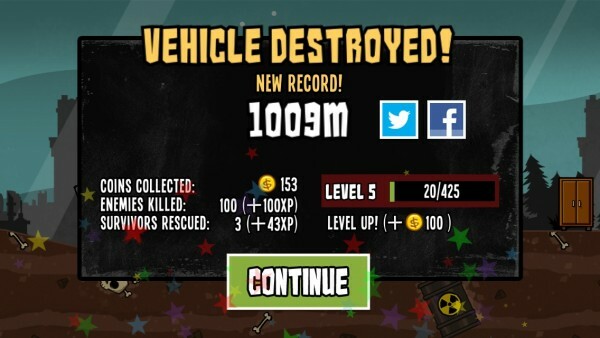 Getting hit by robot missiles will also deplete it a bit. 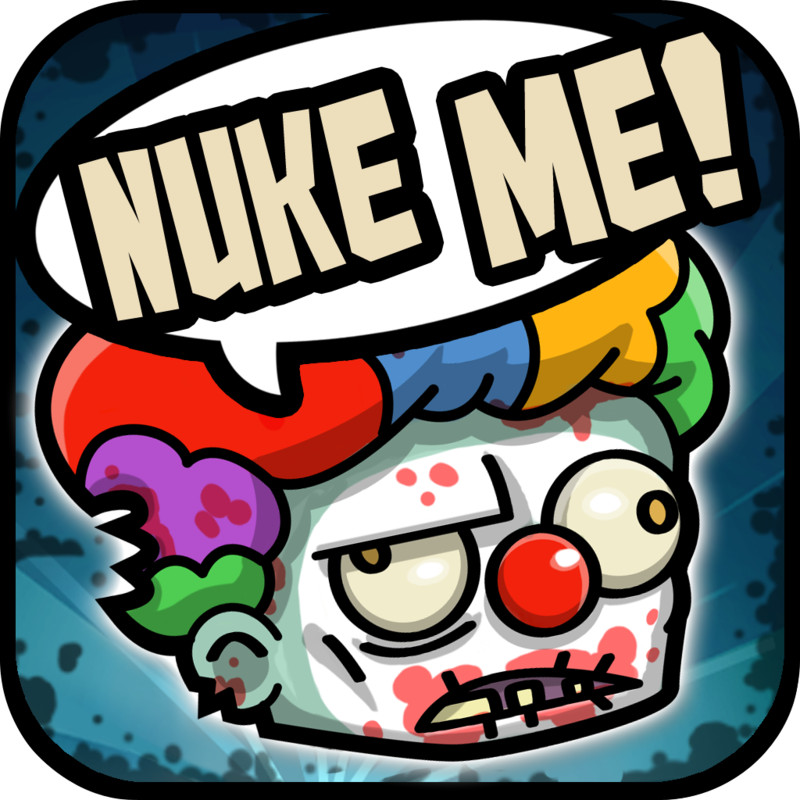 If your car takes too much damage, then you will end up being tasty roadkill for zombies before the nuclear missile gets you. There are also gold coins that you can collect on your brief journey. 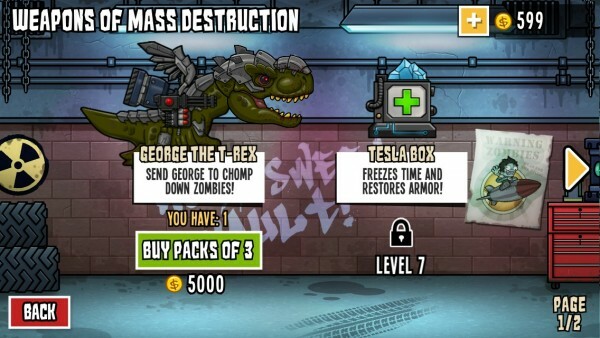 These coins are used in the Vault Headquarters to buy and upgrade your guns, get tougher vehicles, and get some insane secret weapons, like an armored T-Rex that shoots missiles at whatever stands in his way. 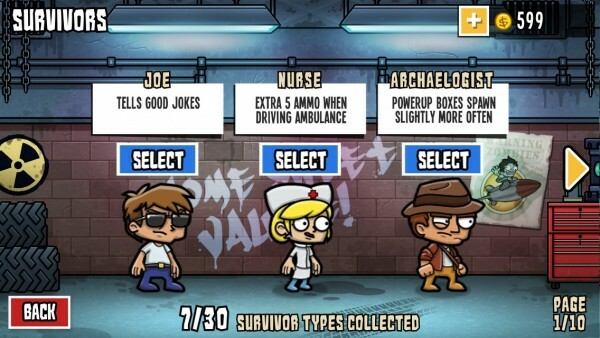 The Vault is also where you go to change the driver from the survivors you’ve managed to pick up and drop off. 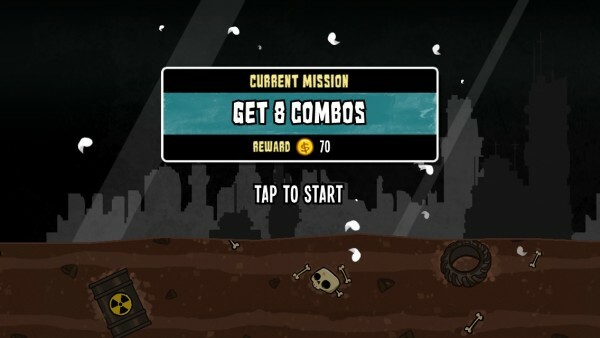 Missions are available as well, which will give you some rewards for completion. 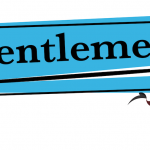 This is pretty standard fare nowadays, but it gives players an incentive to strive for. If you’re low on coins and don’t feel like grinding it out, then you can purchase bundles of coins through in-app purchases. There is also a Coin Tripler power-up that is available as a $4.99 in-app purchase, which I am also assuming gets rid of the ads. So far, I have to say that I’m really impressed with this game. The time frame makes it much more challenging than your average endless runner, and the graphics and music are pretty good stuff. There’s also plenty of unlockable characters, weapons, vehicles, upgrades, and power-ups to obtain as well, which will definitely make the game more interesting as you play. If you’re a fan of the endless runner genre, but want something that stands out above the rest, then I recommend checking out Nuclear Outrun. 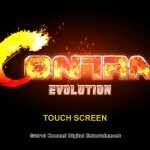 It’s available in the App Store as a universal download for free.